When tourists visit Israel (read: is it safe to visit Israel? ), there are only two cities they are sure to go to: Jerusalem and Tel Aviv. 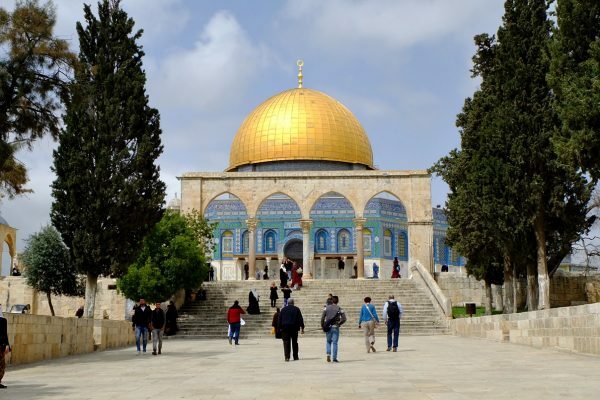 It’s understandable; Jerusalem is a must-visit for a lot of people — for Catholics, Christians, Jews, and Muslims alike. It has a very rich history that has something for everybody. And Tel Aviv, of course, is where the main airport is. But Israel is definitely more than these two cities. It has diverse natural attractions, from desert landscapes and rolling beaches, to lush jungles and ancient cities. 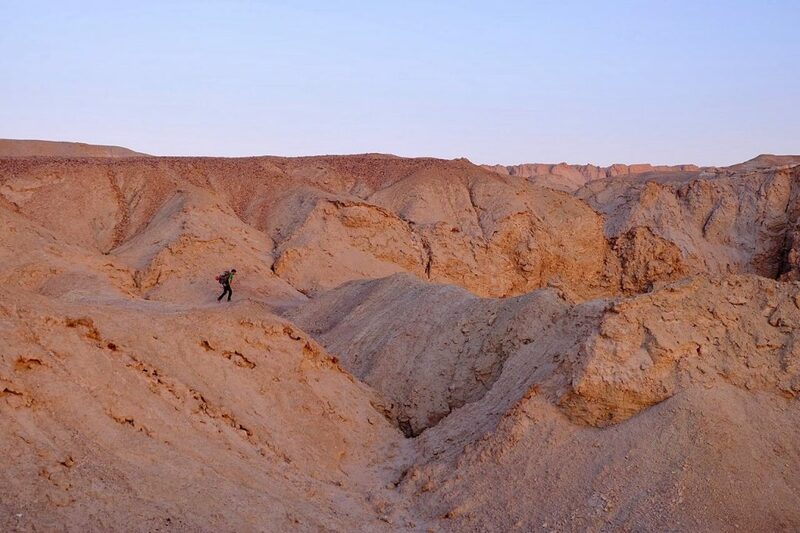 One off-the-beaten path I would highly recommend you to visit would be Arad, Israel which straddles the border of the Negev and Judean Deserts. It’s a small town with at most 25,000 residents and some 10 km from Tel Arad, the site of an ancient city. In the summer months, tourist population in Arad swells, not because of the city itself, but because of its proximity to the Dead Sea (25km) and the Masada National Park (21km). 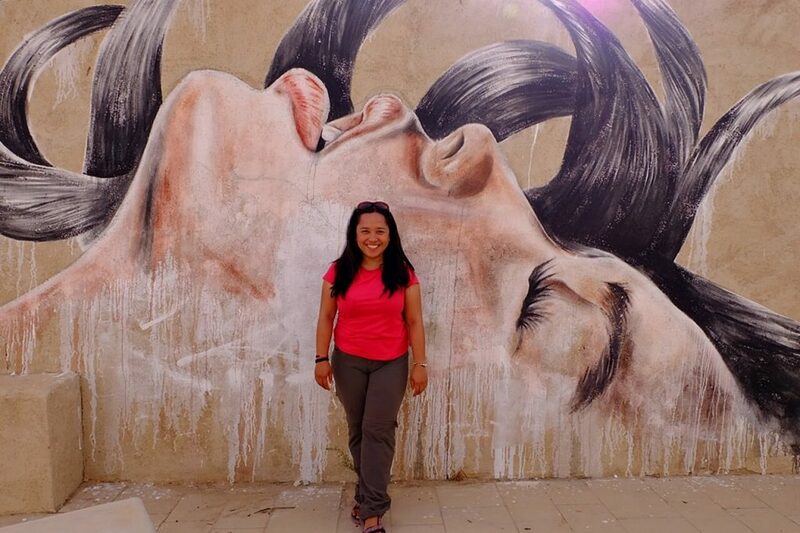 If you find yourself in Arad (buses there go direct from Beer Sheva, Tel Aviv, and Jerusalem) make sure to check out these other attractions to maximize your stay in this quiet desert town. 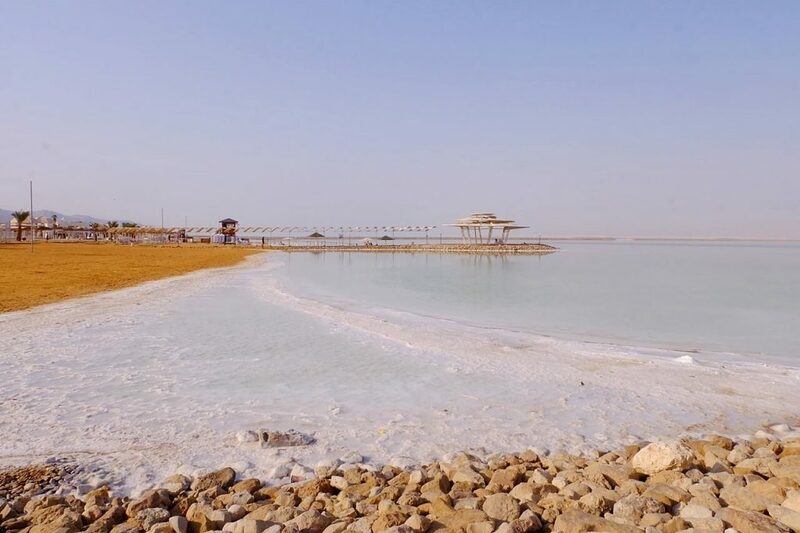 You can reach the Dead Sea in less than 30 minutes from Arad. Around 25 minutes by bus from Arad is the Dead Sea, the lowest elevation on Earth at -400 meters below sea level. People all over the world flock to this place because of the water’s healing powers. From the Arad Central Bus Station, take bus 384 or 421. Get off at any of the beaches in Ein Bokek. There’s a public beach in front of David Hotel. There is no entrance fee. Masada National Park, an ancient fortress high up on a plateau overlooking the Dead Sea, is a spectacular archeological site that’s well worth a visit. It’s accessible via cable car or hiking paths, but it’s not only the gorgeous views that attract tourists from all over the world, it’s also the history. Masada, built in 30 BCE by King Herod, was the last stronghold of a group of Jewish defenders who chose to commit suicide rather than surrender to the troops of the Roman Empire. This group of almost 1,000 people now stand as a symbol of heroism for modern-day soldiers. The best time to go this summer season is during sunrise. Watch the sky lighten over the Dead Sea and see this fortress come to life during the early hours of the morning. 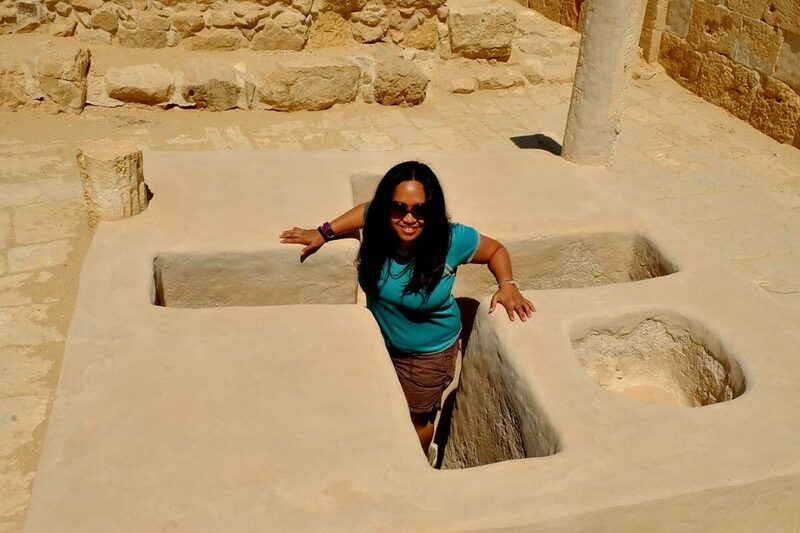 You can book a Masada tour with any travel agency. Important note: If you choose to hike to Masada at sunrise, make sure to bring lots of water and wear appropriate hiking attire. Too many accidents happen to tourists who are not prepared for the physical activity they’re undertaking. Buy insurance before you start your trip so you can file holiday accident claims if something does happen. 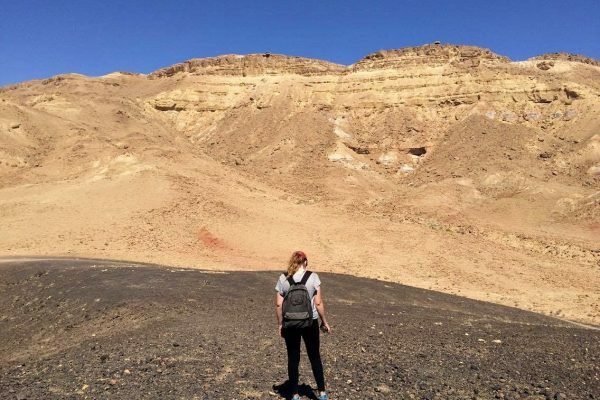 The Masada hike isn’t difficult, but it’s better to be safe than sorry. 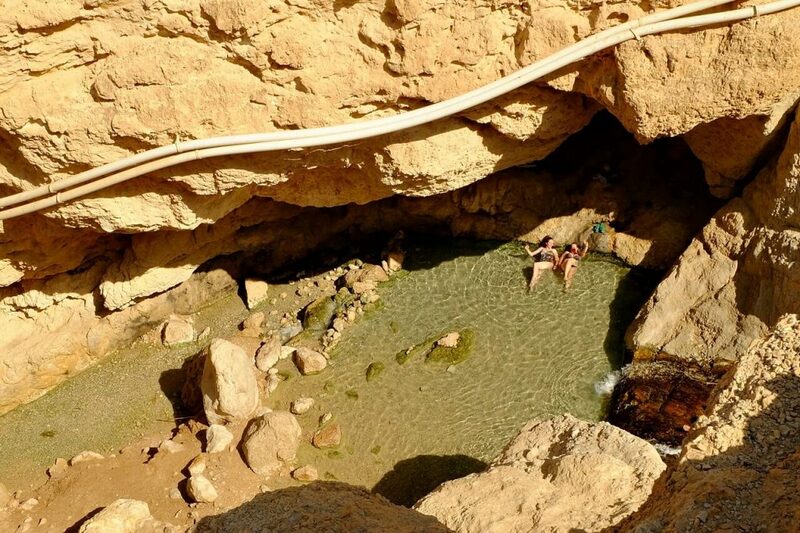 The small falls at Wadi Bokek, near the Dead Sea. 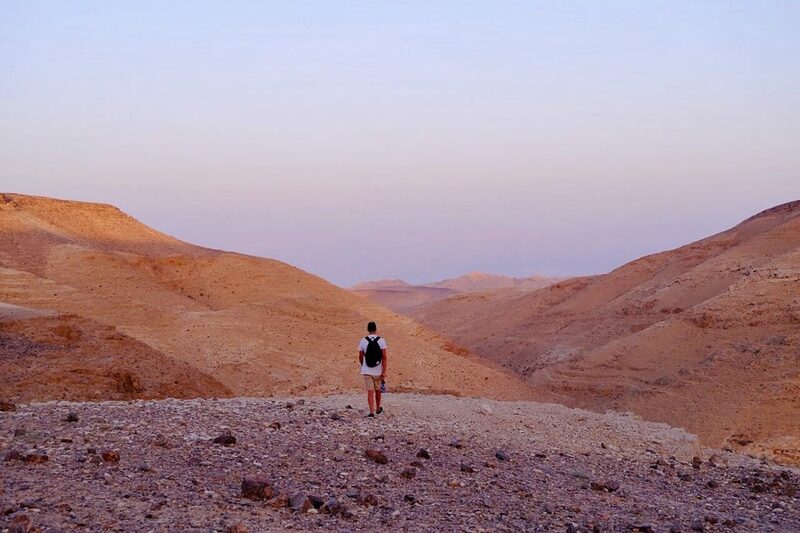 If you feel like a bit of a hike before you go to the Dead Sea, cross under the road — there’s a dried up river bed leading to the hotels in the Dead Sea area — and you will find a trail to Wadi Bokek. Just follow the stream up into the mountain and you will see two pools of refreshingly cool water. It’s a very easy hike, taking less than 30 minutes, and it’s good to do even during the hottest months because of the numerous vegetation in the area. From Arad, take the bus going to the Dead Sea (384 or 421) and get off at the David Hotel. Find the dried up river bed that goes under the highway and then follow the stream upriver. Inside the Mt Sodom salt cave (the white parts are salt). 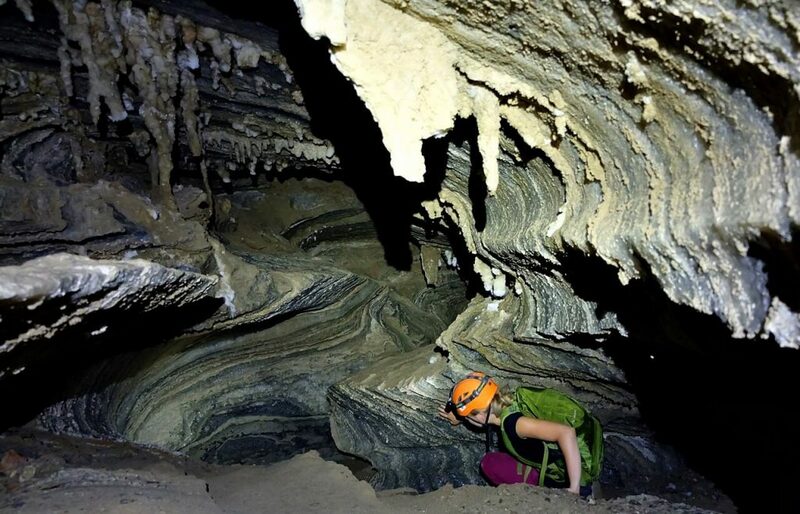 If you love caving — or adventure activities in general — definitely make sure to go salt caving in Israel. There are not so many salt caves in the world, and one of the best is near Arad, in Mt Sodom. The cave itself requires two rappelling (abseiling) sessions; one at 4 meters down, and the second one at 80 meters. While anyone can go there (first timers are okay), people with fear of heights or enclosed spaces might want to opt out. But this activity comes highly recommended; there are cave features you don’t get to see in other caves, like salt stalactites and stalagmites. There are soda straws as well made from salt. The whole thing looks definitely otherworldly! 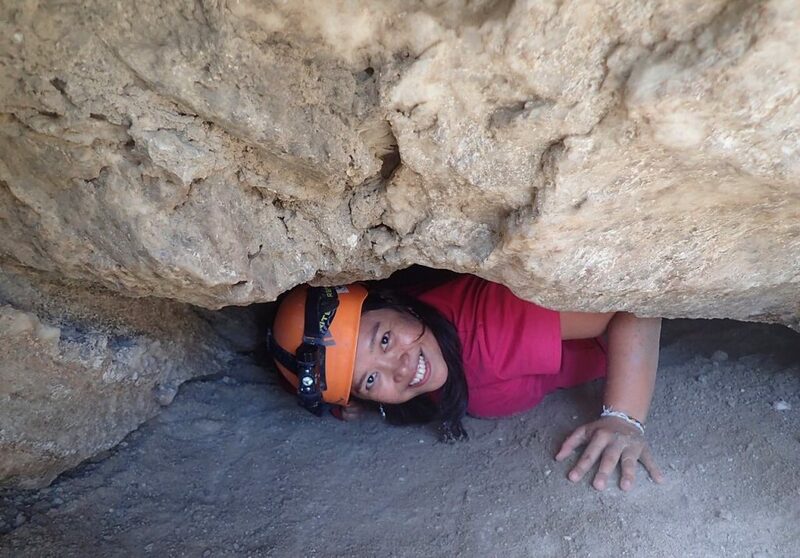 Some places in the salt cave are a tight fit! What makes the cave exciting are the parts where you have to crawl on your belly to get to the other side. There are some tight fits, but as long as you don’t panic and you’re with experienced guides, you shouldn’t have anything to worry about. You can only go there with experienced and licensed guides, given the level of expertise needed and the number of equipment that must be brought along to make the caving experience safe and enjoyable. Don’t attempt to do it yourself. The baptism area in Mamshit National Park. While there are a lot of historically significant archaeological sites in Israel, none is as well-preserved as Mamshit National Park. It is one of the three wealthy ancient cities along the Incense Road that used to be a major station during the peak of the Nabataean civilization. 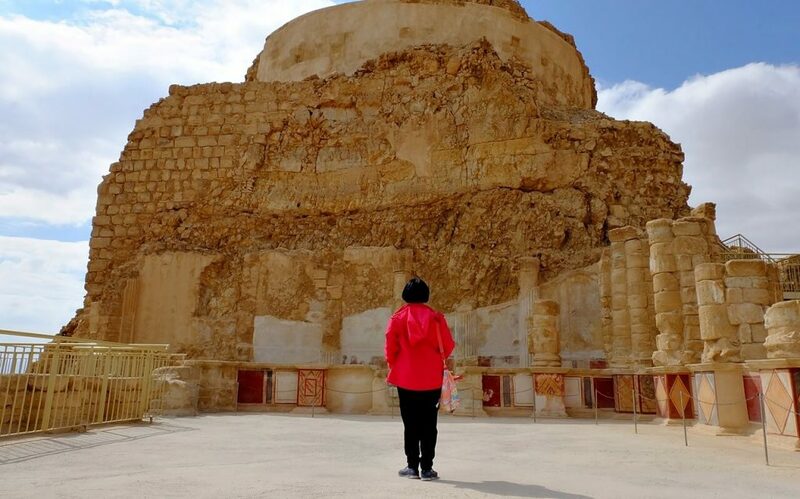 This UNESCO Heritage Site is actually the smallest restored city in the Negev, but it is definitely one of the most well preserved. Entire streets have survived, as well as some rooms, courtyards, terraces, and even a stable. What is remarkable is that even the mosaic floor of the church has survived, as well as a baptism area. In Israel, it is generally better to have a car if your purpose is to see the archaeological sites. Mamshit, for example, isn’t near any bus stop. However, the nearest town is Dimona, so you can get off there, hitchhike towards the direction of Mamshit, and ask to be dropped off at the junction where you can walk for around a half hour or so. Easy hike at the Kidod Canyon. The trail begins at the outskirt of Arad, near Odem St. It’s a short and easy hike, less than 2 hours, but it will take you up and down craggy cliffs that provides fantastic views of the canyon. Anyone can do the Green Trail — just bring at least 3 liters of water, wear sunscreen, and always follow the green marker (white, green, white). The trail ends at the Lookout (a hard ascent for around 15 minutes). The number 1 bus stops there. You can take this bus back downtown. 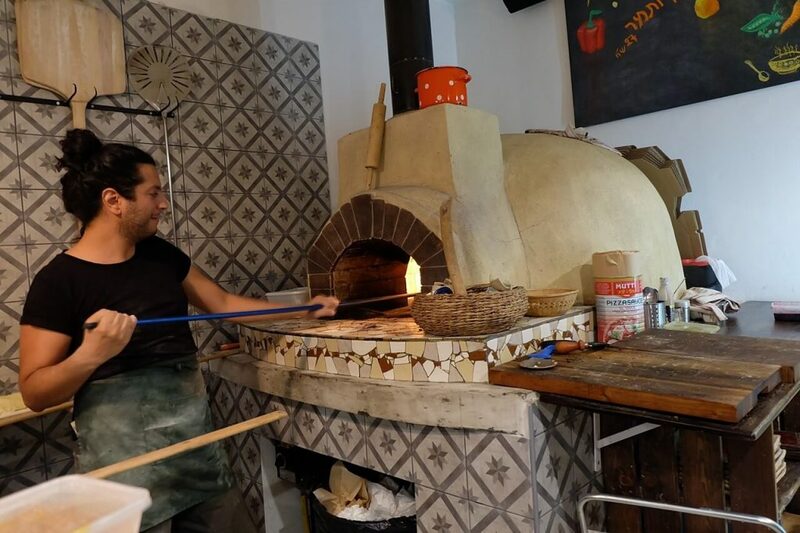 Arad is definitely not Tel Aviv and Jerusalem when it comes to nightlife, but it does have a few places for good eating and drinking out. Here are some I have tried and can recommend. I just love the interiors of Muza! Even if you aren’t a football fan, you would love Muza Sports Bar. It’s only a few minutes’ walk from the Arad Central Bus Station. Its walls are covered with pennants and team scarves, and it has a full menu that offers a range of dishes from edamame and vegetarian sandwiches to hamburgers and chicken steak. Hungry? 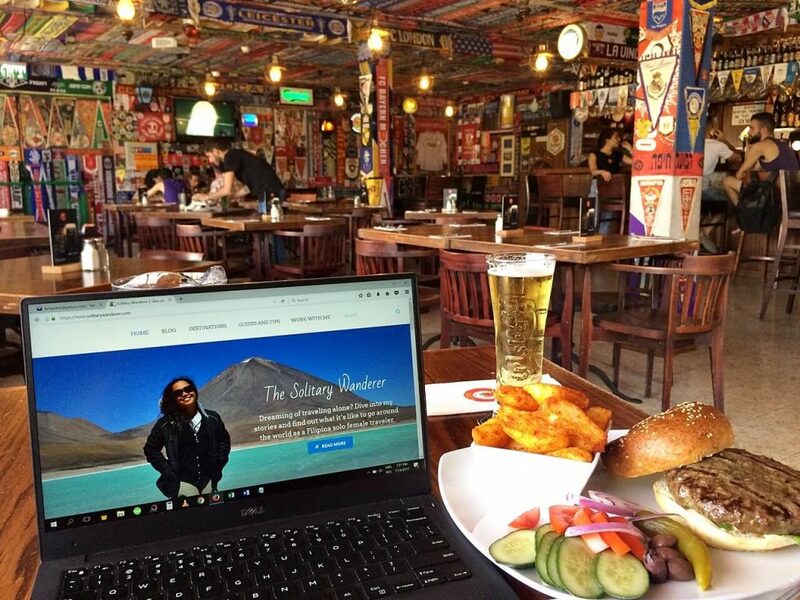 Order the Muza Home Fries (US$8), it’s guaranteed to fill you up in no time at all. They have a range of local and craft beers, too, as well as a selection of foreign beers (e.g., Belgian, German, Mexican) and cocktails. Kaparuchka’s way of making pizza. A lot of tourists are pleasantly surprised that such a small town as Arad would have this lovely Moldovian-Italian restaurant, with great and delicious food, friendly service, and nice ambiance. Try the calzone (I had the one with ricotta cheese and dill, 38 shekels or US$10) and the caramelized onion pizza. Lots of great murals at the Quarter. Located at the edge of town, the Artists Quarter in Arad has a few things to offer. Midbar, the award-winning local winery, has selections of smooth white and reds starting at 90 shekels a bottle. More into beer? The founder of the amazing local beer, Shita, has just opened the Beer Garden. Order your favorite draft beer for 15-20 shekels. Israel is indeed more than just Jerusalem or Tel Aviv. Even a small town like Arad has so much to offer. Go visit when you have the chance! Is Israel Safe For Solo Female Travelers? Oh wow, you’re so brave to go through the caves. I’d probably have a panic attack the moment I crawl through the tight spaces! Nice notes about the national parks! Wow, this country is fascinating even without the religious connection. No wonder you stayed there for a while. So cool that the Dead Sea sits close to Arad Aleah. I love off the beaten path travel. Combine with an urge to see this fascinating place and I am all in. Floating in the salt-water would be fun but seeing this sea with all its Biblical mentions seems even more captivating. Excellent post!